Speaking of the undead*, while we were hibernating for the last few (six) months, Scomadi came back to life. You may remember “Scomadi” as the sixth or seventh name given to the Piaggio-engined vintage-body “Lambretta” that was being hyped for years by the Khurana family (who went on to stick Lambretta stickers on Adlys), CMSI (who went on to Chinese-scooter obscurity), and PM Tuning/Lambretta Innovations. Apparently, PM Tuning finally realized that a mass production run was never going to happen and decided to finally go ahead and build the things themselves in small batches. The first batch of ten Scomadi Turismo Leggara 250**s feature carbon fiber bodies and sell for £7000, which would have been a likely-but-ridiculous price for a production version, but really isn’t a ridiculous price for a hand-built slick-looking collectible modern Lambretta. Cheers, mates, we’ll gladly test one for you! In any case, we’re glad to see all that work finally paying off. PS: Scomadi, you need a title tag in the header on your website. Right now, your site is listed in search engines as a blank space! * Italjet, not Haiti, I’m not Pat Robertson, geez. ** Italian for “League of 250 Scum, on Tour”. Author illnoisePosted on 12.06.08 Categories TNG/CMSI4 Comments on Are they still around? We were so excited to get to the Indianapolis Dealer Expo this year, we were running about 2 hours early. We took that time to go visit Speed City Cycles in Indianapolis, only a few minutes from the Show. Mike and Marybeth Tockey have created a fantastic shop with an ingenious use of space and rural/industrial feel that leaves room for a snack bar, lounge and a ton of scooters and accessories. Mike also builds award winning metric cruisers. Just hanging around his IWL Berliner is a treat. After a great tour and some bench racing we were back on our mission to deliver two scooters to the Scoot! Magazine/ Corazzo booth and still arrive early enough at the hotel for some hottubbing before showing up in time for the open bar at 4PM, whew! Here are our photos from the 2007 Dealer Expo. If you’re a 2sb member, you can log in with your user ID/password to leave comments and rate photos (it finally works). Enjoy, and look for our story soon! The Scoop points out that CMSI’s “L-Series” Website has been updated. Not much, mind you, they’ve added a posterized photo and a couple press releases, but it’s a start. POC Phil insists the new “L-Series” is the same prototype they’ve been showing off for years, with some minor cosmetic changes, and even CMSI’s Seattle neighbors Microsoft have never stalled a release this long, but Lambretta fans remain hopeful, and we look forward to the chance to talk to CMSI at the Indianapolis Dealer Expo. 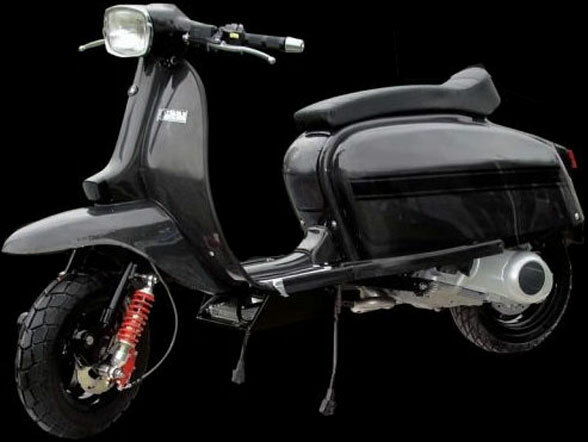 The Scooterscoop has translated a translation of a translation of a press release about CMSI/Lambretta Laboratories’ “L-Series” modern Lambretta. PM Tuning (Lambretta Innovation) has a series of photos of the L-series “new Lambretta,” showing various stages of assembly, and more photos from the EICMA show (Thanks, Stephen and Chad) The engine is, in fact, the Piaggio QUASAR 250ie motor found in the Vespa GTS, Piaggio MP3, and several other Piaggio Group scooters. The bike is being evaluated by Piaggio for engine approval and another Italian company is preparing drawings and production plans. Several years in the making, the new Lambretta is getting tantalizingly closer, but there are still a few hurdles ahead. Back from the dead: CMSI “L”ambretta? Follow-up: Looking at the photos from the 2005 debut of the Lambretta prototype, the scooter in Milan is pretty vastly different. It appears to be more orange than red, (or poorly color-balanced) and the speedometer, rear turn signals, and glovebox, among other details, would indicate that this is either an entirely new prototype, or the old one was heavily modified. Any engine nerds want to take a stab at what’s inside? Author illnoisePosted on 20.11.06 20.11.06 Categories Lambretta, TNG/CMSI7 Comments on Back from the dead: CMSI “L”ambretta? California importer/exporter Global Discoveries has brought their Chinese-manufactured Eco-Glide to the Costco catalog. Hopefully, Global Discoveries have learned from TNG’s problems dealing with China and Costco. Pacific Cycle has no comment regarding ongoing litigation, except that we are surprised and disappointed by these claims. We feel the claims have absolutely no merit and intend to defend vigorously. Pacific Cycle stands by the quality of its products and its relationships with its OEM partners. 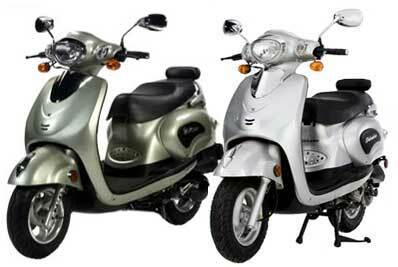 You may find it worthwhile to review a variety of scooter OEMâ€™s Web sites to note the similarities between their catalogâ€™s standard, stock models and scooters distributed in the U.S. and around the world. Fair enough, and we’ve noted that there are hundreds of US importers selling the same handful of Chinese-made scooter models (most commonly based on the Yamaha Vino design) under different brand names. Perhaps CMSI has written off smaller fly-by-night importers as being not worth worrying about, whereas a well-known name like Schwinn is a much bigger threat. And again, the lawlessness of the Chinese business frontier will certainly cloud this case– TNG probably has little recourse against their Chinese suppliers. It will be interesting to see how this plays out, the Yamaha settlement last week was an interesting precedent. Perhaps Yamaha will parlay their trademark victory into more lawsits against US distributors of Vino clones, if so, both TNG and Schwinn could be looking at even bigger problems. Schwinn & TNG links linked? Which got us thinking “maybe they’re actually related somehow” but Whois records and Google searches provide no indication that CMSI (TNG’s parent company in Washington state) is involved in Schwinn Scooters (a division of Pacific Cycle who own Schwinn, Mongoose and GT, based near the Pacific in Madison, WI). I’ve emailed TNG to hopefully find out more. Author illnoisePosted on 04.04.06 18.04.06 Categories Schwinn, Scooter News, TNG/CMSI2 Comments on Schwinn & TNG links linked?